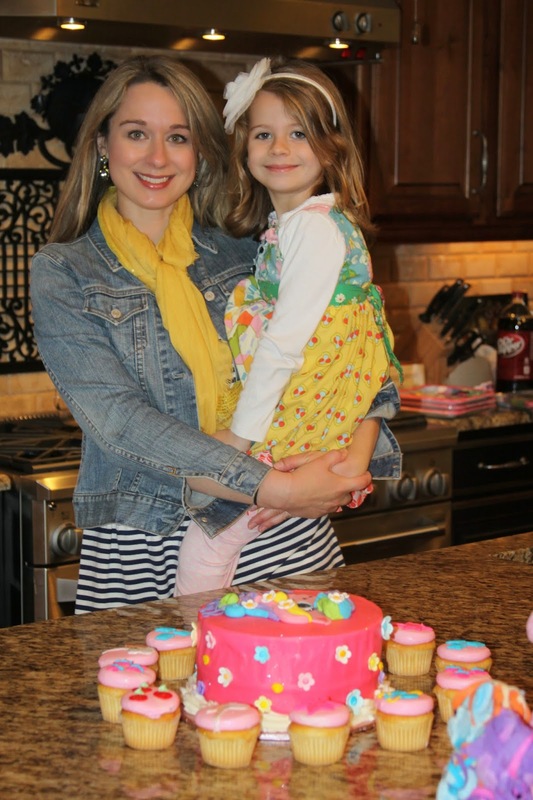 *A few months ago I was asked to write about some of the struggles that pastors wives face. This one is about the pressure to have it all together or to look like you do. Something reminded me of it tonight and I thought I would share it here. After years of being raised in and feeling right at home in church, I got to high school and began to feel like an outsider. I remember the day that sealed the deal. In my 10th grade Sunday school class we were encouraged to break into various small groups to discuss the things kids our age were going through. I went to the corner of the classroom designated for the peer pressure discussion and waited for others to join me. No one came. I quickly found another group to join so I wouldn’t look like a loser. It was absolutely demoralizing to realize I was the only kid in my grade battling the temptations that bite at the heels of teenagers. That was the last time I went to youth Sunday school or made an effort to be part of our youth group. I couldn’t relate to all the kids who “had it all together” and never experienced the pressures I felt. Separated from the flock, I eventually succumbed to those pressures and suffered greatly, believing I was the only one to fail. Years later, I know that I was not the only kid in my class who was dealing with peer pressure. I must have been the only one desperate enough to admit it that day. Perhaps the peer pressure to seem perfect at church was even stronger than the peer pressure I was dealing with in my high school. That is a scary thought. As a pastor’s wife, I play a very large part in setting the atmosphere of grace and transparency in my church’s culture. Authenticity starts with me. After what I experienced as a teenager, I reject the lie that I should either have it all together (no one does) or project the illusion that I do. Sometimes the lie originates in my heart and sometimes it comes from another person’s expectations. I tear it down as often as I can with a simple and powerful phrase: “Me too.” These words can lift a heavy burden in a split second. They can brighten the countenance. They can wrap a cloak of fellowship around a shivering, lonely sister. We certainly don’t need to say “me too” when it doesn’t fit, but our attitude of humility and love should fill in the gaps when we can’t relate to our sisters. Woe to me if I can have a conversation with a woman who is stressed out, in pain, disappointed, struggling as a mother, or in a rut in her marriage and then let her believe that I’m above it all. Woe to me. The way I see it, I can use my energy to have authentic, meaningful relationships and interactions with our church members or I can use my energy to create illusions and desperately try to maintain them. In one hand I have community and the love of Christ, and in the other hand I have isolation and vanity. Sometimes it’s hard to know how far to take authenticity. There’s a fine line between transparency and letting it all hang out. I know I miss the mark sometimes, even if my intentions are good. The line we’re looking to walk can only be discerned by the Holy Spirit, so it is important that we keep in step with Him in our interactions. 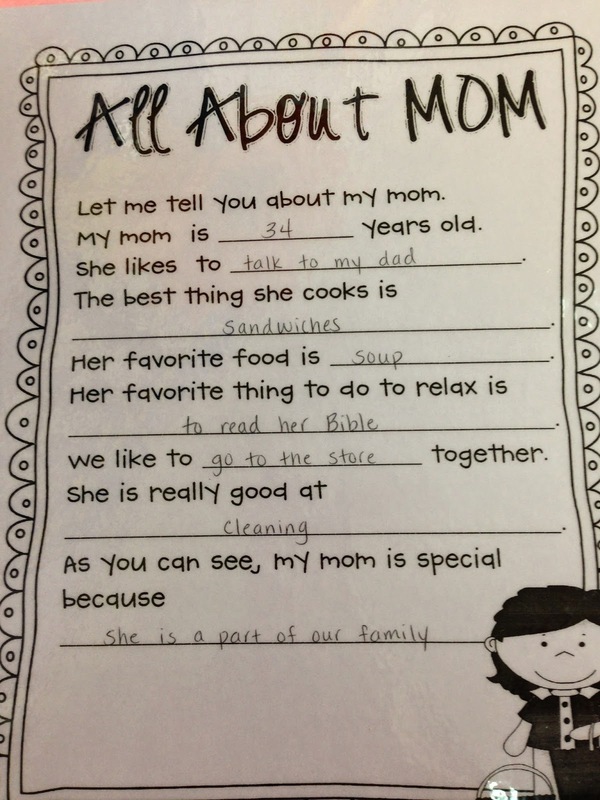 By the time you have an 8-year-old and a 5-year-old, you've had plenty of opportunities to be humbled by the annual Mother's Day Questionnaire. There was that time when Jackson was in Kindergarten when he wrote that his favorite thing about me was "my body." More recently, my children have answered the "My mom likes to ______" question with "lay on the couch" and "take a nap." Right before Mother's Day I took Annabeth to school and she was very excited to show me a new piece of work that was hanging in the hallway outside her class. Mercifully, this year's questionnaires did not have the children's names on them, perhaps in order to protect the innocent - or the guilty. I would've known which one was hers because she always draws her self-portraits with a bow. This time she gave both of us a heart-shaped bow. She's so wonderful. 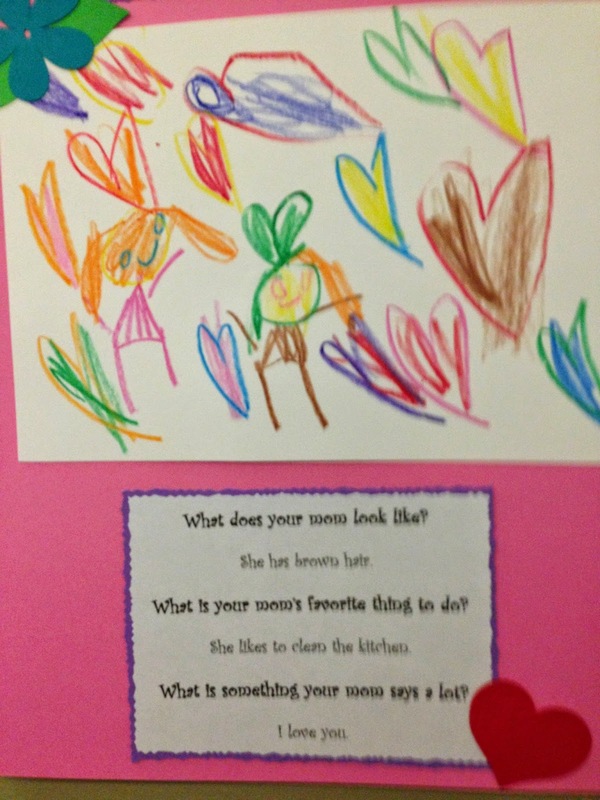 I read the fateful question: What is your mom's favorite thing to do? She likes to clean the kitchen. Ladies and gentlemen, this is redemption. That's right. My daughter thinks I love domesticity. She might even think I excel at it. Both are untrue, but it doesn't matter because my daughter honored me, however anonymously, for all eyes to see. Muahahaha! 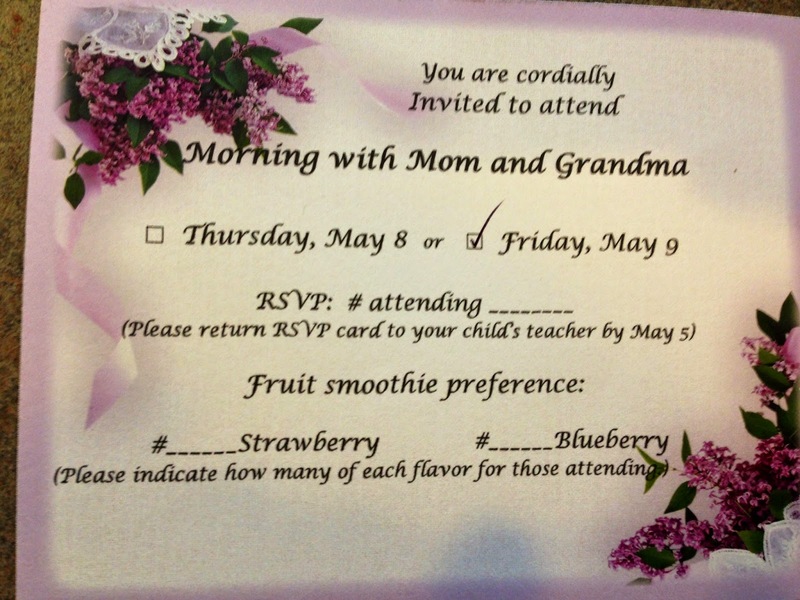 On the Friday before Mother's Day, Mom, Melissa and I got to attend a "Muffins with Mom" type of event with Annabeth in her class. We had a sweet time with our little darlin'. There was yet another questionnaire - this time laminated to preserve the answers for years to come. Will my redemption continue? Well, it was a mixed bag. Annabeth thinks I'm really good at cleaning (yay, cleanliness! ), but the best thing I cook is sandwiches. Bahahaha! Oh my gosh, I love my child so much. I feel the scale was tipped toward a win for me though. There wasn't as much laughing going on by the time Saturday came. I was feeling pretty melancholy about Mother's Day. There's so much pressure to be happy and shiny on that day, and I couldn't stop thinking about how much pain my mama heart has felt this year. We had a second failed adoption placement the week after Easter and, honestly, I just felt sorry for myself. Curtis had some pastoral ministry to do on Saturday, so I reached out to my mom and asked if we could come out to her property and get gritty and messy. I was feeling gritty and messy on the inside, so I couldn't think of anything better. We started with an experimental bike ride. I didn't know if the kids would be able to ride their bikes successfully on the trails but they did great. A few places were hard for Annabeth, but I think this is something we could do again. After we were good and hot (it was like 90% humidity that day) we took the golf cart down to the creek and played in the sand. We named this spot Bibby's Beach. Please just call me Nature Mom, y'all. No longer Napping Mom, but Domestic-Nature-Sandwich Mom. To my delight, I received my very first coupon book from Jackson on Sunday morning. He made it at school. Included in my many coupon options are a back rub, a foot rub, cuddle time, cereal in bed, and the gems pictured below. My child's handwriting struggles, so I'll help you out: "90 min of TV time" and "No food for 100 min." I died. Jackson explained that these two are actually for him. If I need some peace and quiet, I can make him watch TV for 90 minutes. If he's driving me crazy by asking for food non-stop, I can make him fast for 100 minutes. I will never get over the split second I thought I needed my child's permission to watch TV or to diet. Ultimately, I had a good Mother's Day. God gave me the grace to smile and be happy and have so much gratitude for the son and daughter that have been entrusted to me. I've been advised to stop trying to figure out what everything means or understand why and what God is doing. One day I will know. For now, I have to move forward with these two turkeys and that awesome man of mine. Regardless of my readiness or ability to visualize this milestone in my family's life, the day to register Annabeth for Kindergarten came and went. About a week ago, after requesting shot records from the pedi for the umpteenth time, I finally got my junk together. One of my dear friends and I took our girls up to the school to fulfill our motherly duties. I felt a mixture of happiness for Annabeth and sadness that my little shadow will be detached from my person next August. Another very dear friend works at the school and she happened to come through the office while we were there. She told the girls how excited she was that they would be there with her next year. She even took them by the hand and showed them the Kindergarten wing of the school. It was so precious to see them walking down the hall together holding hands. I melted. I want to say something to those of you who love Jesus and who work in public schools. You are ministers. You minister to children. You minister to their parents. You bring the Kingdom into your school whether you are ever able to utter the name of God. Your calling is important and I thank you for your very hard work and dedication. After registration it was time to celebrate this rite of passage with the girls. We considered getting their ears double pierced but thought Merle Norman probably isn't into that. I'm totally kidding. 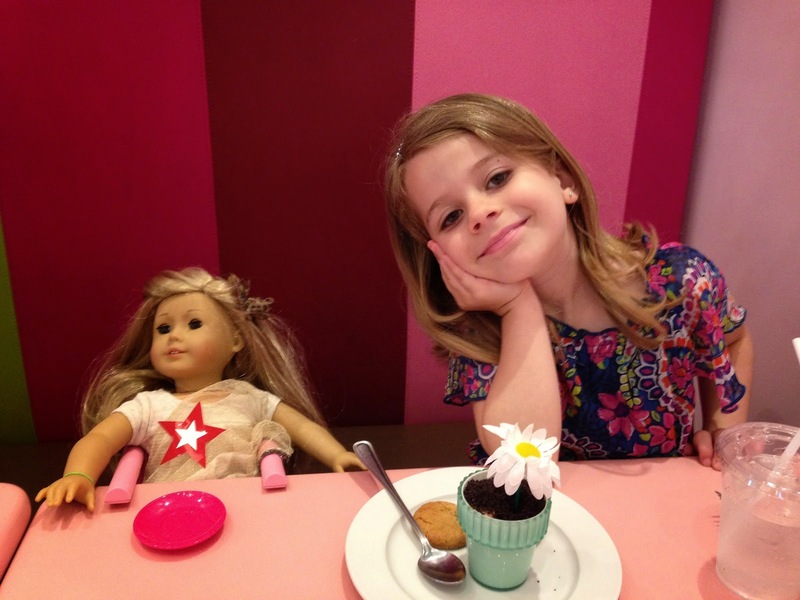 We went to the American Girl Bistro at Memorial City Mall and had lunch with the girls and their dolls. 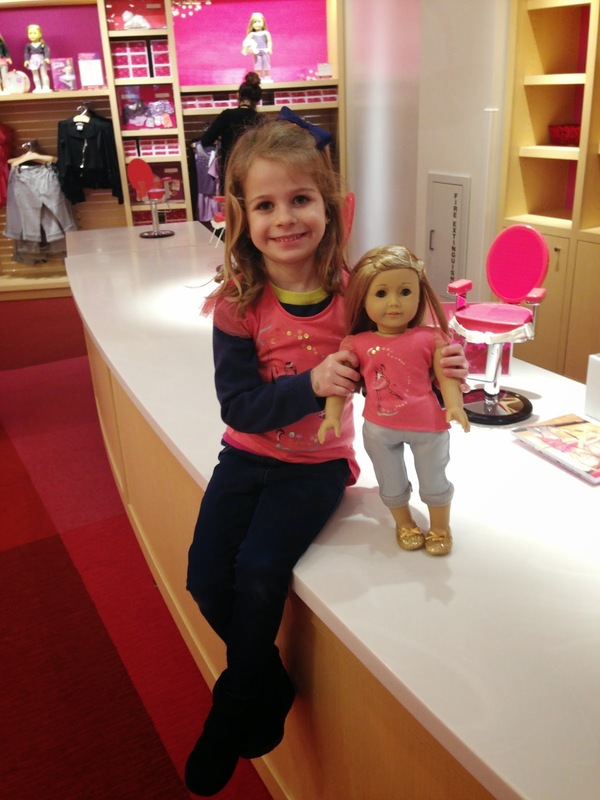 Annabeth got her doll, Isabelle, on her fifth birthday. 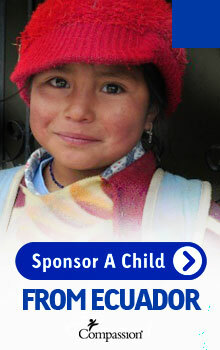 It was special to me because I had an American Girl doll (Samantha) when I was a kid. I was right on the verge of being too old when it I first learned about Pleasant Company, but I loved the stories, clothes, and historical nature of it all. My best friend and I used to climb up in her oak tree and look through the catalogs for hours. And since we're on the topic of her birthday and y'all know I have a thing for cake, here are a few more pics. When she saw her cake she tried to dive out of my arms and hug it. If it isn't obvious, this is supposed to be My Little Pony-ish. Having a daughter has been everything I hoped it would be and more. Annabeth is smart, affectionate, cheerful (except when she wakes up), and she loves Jesus with a precious childlike faith. She's also the funniest person in my life. The years ahead will have more wonderful experiences for us than I could ever count, and I know this sweet preschool season has to pass before we can have them. But they sure have been great.